Jockey James Innes Jnr is well aware of the tactical speed battle that awaits him on lightly raced mare Pendeloque at Randwick on Saturday. And it’s a battle he’s confident he can win given he knows Pendeloque’s strengths and weaknesses better than anyone. The new season four-year-old resumes from barrier one in the Australian Turf Club Handicap (1000m) and Innes Jnr sees that as an advantage as he chases a breakthrough win of his own. “We've drawn a good gate which is encouraging, she'll bounce out and her natural speed will have her in the first four,’’ he said. “There's a lot of speed in the race so I'm not going to kill her to lead, just put her wherever she tells me she wants to be. Pendeloque, rated $5.50 with TAB on Friday, has won three of her seven starts for trainer Gerald Ryan and all three, plus a close second to Viridine, have been under the 23-year-old’s guidance. It’s been almost a month since the second of her trials this preparation but she was being considered for a trip to Adelaide for the Listed Lightning Stakes, run last weekend. When boom sprinter Nature Strip was confirmed to be heading there it forced a change of plan. The two trials proved Pendeloque is in good order following an incident in her last win, over the Randwick 1000m, in January and an episode of cardiac arrhythmia before a spell. “She feels well in her work and after her second trial she’s really come on,’’ Innes Jnr said. It’s hard to ignore that Pendeloque was run down late in her 900m trial at Rosehill on July 9 by Group 1 winner Music Magnate with another classy mare in Egyptian Symbol running third. Both of those horses take on the Group 2 Missile Stakes on Saturday. When asked whether the trial was as good as it looked, Innes Jnr’s response was a simple one – “yes, it was’’. 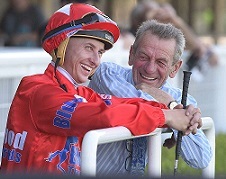 It’s been two months since Innes Jnr’s apprenticeship ended and he opted to miss a few rides at Kembla Grange on Saturday to partner Pendeloque at Randwick. One of those rides is Pendeloque’s stablemate Adamina, engaged in race three, and he said he’d be surprised if that filly isn’t in the finish. He’s chasing his first city win since the end of his junior rider status and would like nothing more than for it to be on one of his favourites. “Being a senior now it’s a bit tougher but hopefully she can produce my first city win and get the ball rolling a bit, especially for Gerald who has been a huge supporter,’’ he said.